Thermaltake's eSports series grew one chassis stronger today with the enthusiast-grade Overseer RX-I. Priced at €102 (~$140), the full tower crams the functionality of Thermaltake's $160 Chaser MK-I into a more affordable package. It appears the company shed some materials as the Overseer RX-I is smaller than its sibling, measuring 21.1 x 8.7 x 22.8 inches and weighing 22.7lbs (an inch shorter, half an inch narrower and three pounds lighter). 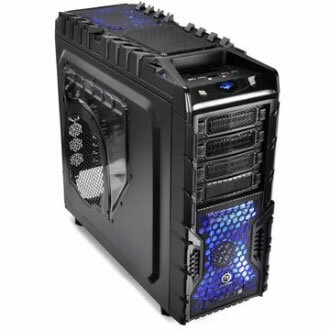 Although it might be less of a tank, the new arrival is equally roomy, supporting E-ATX motherboards (12 x 13 inches), up to eight expansion cards with space for 13-inch-long graphics cards as well as CPU coolers standing nearly 7 inches tall. You'll also find room for four 5.25-inch devices along with five 2.5 or 3.5-inch drives. The Chaser's tool-free mounts left a good impression on us earlier this year and the Overseer seems to borrow this design. As with most aggressive designs, the Overseer has set itself up for a love/hate relationship among enthusiasts. The accompany its sharp lines, the enclosure features an all-black paint job (including the interior), a left panel window and a so-called "breath lighting effect." Although the spec sheet fails to mention eSATA connectivity, it's clearly visible in product photos alongside two USB 2.0 and 3.0 ports, an audio jack, as well as a dock for 2.5 or 3.5-inch drives. Cooling is handled by two 200mm fans (one in the front and one on top) and one 120mm rear exhaust. If you need additional thermal dissipation, you can add a second 200mm top exhaust, 200mm side intake and 120mm bottom intake, not to mention the pre-drilled holes for liquid cooling setups. It's worth noting that the Chaser MK-I shipped with a similar cooling configuration and it didn't fare particularly well in our recent gaming chassis roundup.